In this blog post, we'll explore how we can customize the Gson serialization of Java objects. There are many reasons why you might want to change the serialization, e.g. simplifying your model to reduce the amount of data sent or removing personal information. Now we'll look into the simplification of an object by implementing a custom serializer. We'll dive into in a second, we don't need to send the full objects to the server anymore. We just need to send the IDs of the objects. If you're interested to learn how you can achieve that, and also learn how to customize the serialization, keep reading! Let's imagine our app fulfills the following scenario: the app pulls in a list of available merchants from the server. The user can select a subset of that list as his new subscriptions. The app needs to send back the user information and his selection to the server in a network request. First, we need to create the model classes for the data we're sending back and forth. It might not be as obvious with this small of a model, but if you imagine the merchant model being much more complex, our request JSON gets quite big. However, this isn't necessary! The server already knows the merchant information. The entire merchant objects are redundant! The server only needs to know the IDs of the merchants the user wants subscribe to. This gets us quite close to the optimal result. Nevertheless, we still can reduce it a little further. Additionally, this approach might be problematic if the app sends merchant objects to other endpoints when it does need the full object. Since the first approach has its limitations, it's time to look at the better solution: custom serialization. We want to limit the serialization of the merchant objects on a request basis. Sounds complicated, but Gson makes it pretty easy. Most of the code above should look familiar if you've done the previous tutorials. The only unknown is the registerTypeAdapter() method. It takes two parameters. The first one is the Type of the object that requires a custom serialization. The second parameter is an implementation of the JsonSerializer interface. As you can see, we type the JsonSerializer and override the serialize method. It gives us the object (as src) that needs to be serialized. The return is a JsonElement. How you create a JsonElement from your src object depends on the situation. In the snipped above we simply created a new, empty JsonObject and added one property with the ID of the merchant. This serialize callback will be called every time Gson needs to serialize a Merchant object. In our case this would be for every object in the merchantList. As you can see, the result is the exact same as we would achieve with customizing the serialization via annotations. Additionally, the serialization callback gets called for every element in the list. In the next section, we'll customize the serialization of the entire list, and not just single list items. You've seen the structure of custom serialization in the previous section. Now we'll adjust it to make our request JSON even smaller. The trick is to target the List<Merchant> part of the JSON. Since we're now going for the list object, we need to use the TypeToken class. If you're a little unsure why that's necessary or what the TypeToken is used for, you can freshen up your memory by going back to our Java Lists blog post. In the serialize() callback we're creating a new JsonObject and add just a single property. That property Ids contains a string with all the merchant IDs. The advantage is the reduced size of the JSON. Especially with a larger number of merchants this would mean less data to transfer back to your server, which makes your app a little faster and your app user happier. However, this solution is a little weird. Sending IDs in a concatenated string is not a standard way of doing it. The best way in the JSON world would be to send the merchantList as an array, and not an object. You've seen in the past couple of sections, customizing the serialization with GSON is fairly simple on the technical side, but not as straight-forward on the logical side. You really have to think about how you want to structure the data you're sending to the server. Gson is quite flexible and can cover a lot of different cases. Despite its capabilities, there are a few pitfalls. One common unexpected issue is the (accidental) overwrite of a custom type adapter. If you declare a type adapter for the same type multiple times, Gson will only respect the last registerTypeAdapter() call. As you can see in the snippet above, only the last registerTypeAdapter() is relevant. Registering a (de)serializer for the same type multiple times can happen quite easily, if you don't pay attention. Thus, if you're adding a new custom type adapter, double check if you haven't already implemented and registered something for that type somewhere else. The idea is pretty clever: when you're customizing the JSON mapping, you often have to map a bunch of properties manually (see the code examples in the previous sections). The approach to call serialize() in the custom serializer does that work for you. 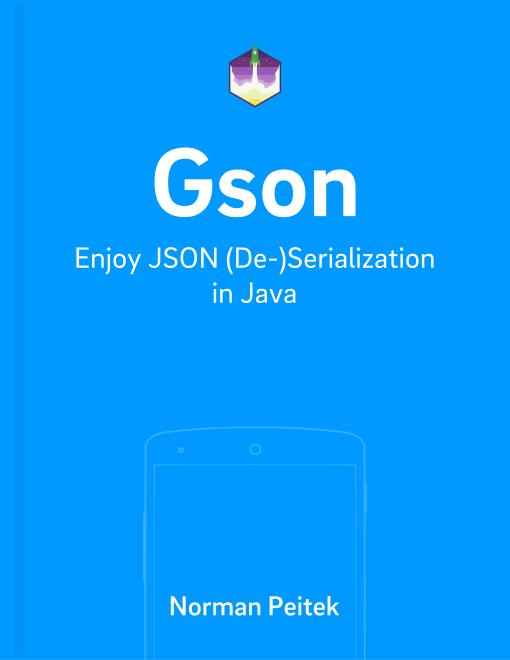 In this blog post, you've learned how you can utilize Gson's custom serialization to minimize the requests JSONs. This can be quite helpful when you're trying to optimize your apps network usage. However, this is not the only use case for custom serialization. In the next blog post, we'll look at custom serialization one more time. Next time the focus will be on serializing objects which have no or an unfitting default serialization.